Claudia McNeil is best remembered for her laudatory performance as the matriarch in the stage and screen versions of Lorraine Hansberry’s widely-acclaimed play A Raisin in the Sun (1961). McNeil was born in 1917 in Baltimore, Maryland to Marvin Spencer McNeil and Annie Mae Anderson McNeil. She was adopted by a Jewish family, named the Toppers, in her teenage years and briefly married by the age of 18. McNeil then worked as a registered librarian before the inception of her entertainment career. McNeil first performed as a dancer with the Katherine Dunham troupe during the tour of South America in 1951. 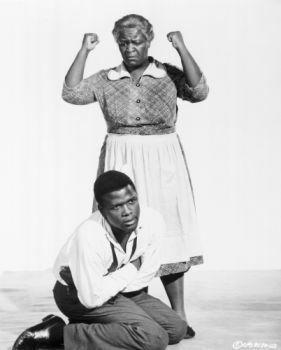 She later performed as a nightclub and vaudeville singer before making her acting debut in Arthur Miller’s The Crucible (1953); and later performed in Langston Hughes’s Simply Heavenly (1957), for which she received a Tony nomination. In 1965, she appeared in James Baldwin’s The Amen Corner, for which she garnered the London Critics Poll Award for best actress. Yet it was her portrayal of Lena Younger in the theatrical 1959 production of A Raisin in the Sun that led McNeil to stardom. In this drama which reflected on racial and social class tensions in and around African America, McNeil portrays a mother determined to rebuild a cohesive family unit by moving her family out of the Chicago ghetto. In 1961, she duplicated her success in the screen adaptation of A Raisin in the Sun and received an Academy Award nomination. Over the next two decades, McNeil continued to appear in a number of films, television soap operas, and plays. After retiring in 1983, McNeil moved into the Actors’ Fund Nursing Home in Englewood, New Jersey where she succumbed to complications caused by diabetes in 1993 at the age of 76. Hazel Garland, “Claudia McNeil Claim’s Star’s Life Isn’t Easy,” Pittsburgh Courier, March 17, 1962; Edward Mapp, ed., Directory of Blacks in the Performing Arts (Meluchan, New Jersey: Scarecrow Press, 1978); Eric Pace, The New York Times Biographical Service, November 29, 1993.